This is a fun project to help kids learn more about the Christian faith. This Jesse Tree helps to tell the story of the Bible from creation to the birth of Jesus Christ. Jesse Trees can be used during Advent to help prepare for Christmas. This book has 24 ornaments to color and cut out and a pattern to make a tree out of construction paper to display the ornaments. There are also Bible stories for children and Bible passages for each ornament. 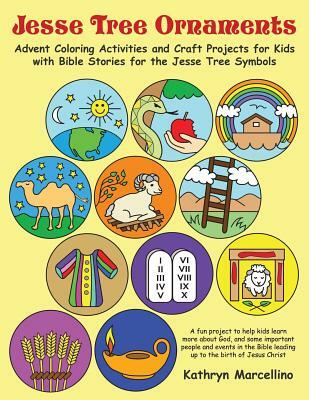 Jesse Tree Ornaments: Advent Coloring Activities and Craft Projects for Kids with Bible Stories for the Jesse Tree Symbols by Marcellino, Kathryn was published by Abundant Life Publishing in September 2015 and is our 38189th best seller. The ISBN for Jesse Tree Ornaments: Advent Coloring Activities and Craft Projects for Kids with Bible Stories for the Jesse Tree Symbols is 9781944158002. Be the first to review Jesse Tree Ornaments: Advent Coloring Activities and Craft Projects for Kids with Bible Stories for the Jesse Tree Symbols! Got a question? No problem! Just click here to ask us about Jesse Tree Ornaments: Advent Coloring Activities and Craft Projects for Kids with Bible Stories for the Jesse Tree Symbols. I expect not, but I just wondered if the colouring pages in this book are photocopiable? I have three children who would all probably enjoy colouring the ornaments but I don’t have the resources to buy three copies of the book. Thankyou for your help.